Druj hails from the USA and consists of vocalist/guitarist Sean Holladay, guitarist Connor Tetlow, bass guitarist Wayne DeWilde and drummer Adam Kimball. In September 2017 they already released their two-track debut EP called The Malignant Dweller. 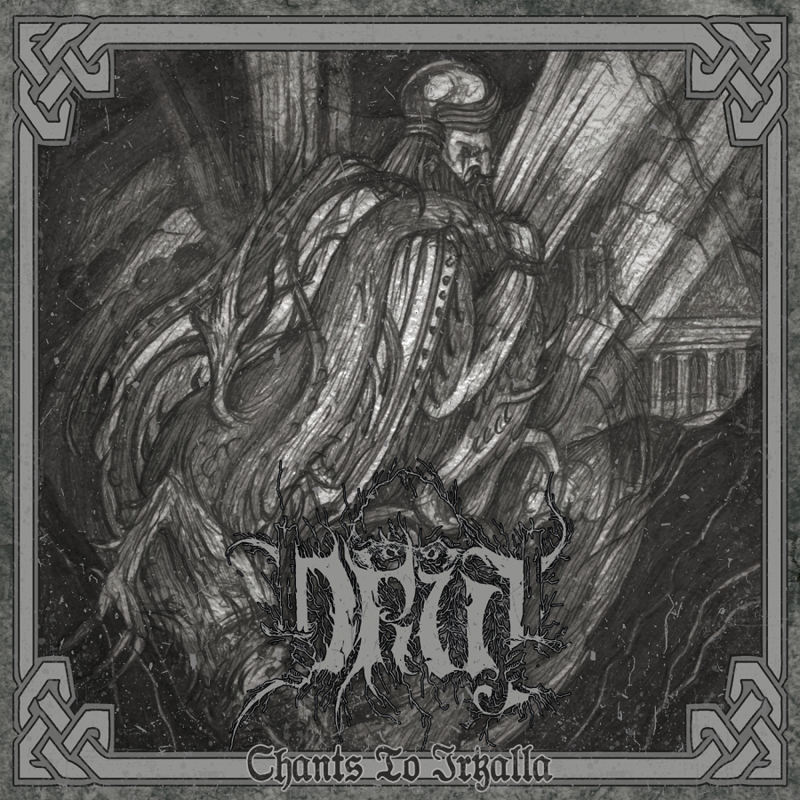 Now, since October 1st, they’ve released the successor of that EP, their full-length debut called Chants To Irkalla, via Godz Ov War Productions. Druj’s music can be described as a sludgy form of death/doom metal. Chants To Irkalla immediately starts very promising with the 10-minute long opening track Ziggurat Ablaze. This track starts with high guitars and a few moments later some very nicely drums and a greatly roaring bass are added. The high guitars slowly change to lower riffing and finally the heavy vocals are added which makes everything complete. Ziggurat Ablaze also is the longest track on Chants To Irkalla which has six tracks varying in length between a bit less than 5 minutes to a bit more than 10 minutes. Despite having only six tracks, Chants To Irkalla has a total length of almost 45 minutes. The guitar riffing on Chants To Irkalla are mainly sounding low with, as I mentioned earlier, sometimes an exception. At some moments, for example in the earlier mentioned Ziggurat Ablaze as well as in closing track Ashes of Immortality, high and low guitars can be heard both at the same time. Speaking about the guitars on this album there is one specific moment that stands out the most. That are the very nice sounding roaring guitars halfway the title track. Another instrument which surely adds to Chants To Irkalla‘s great sound is the very roaring bass. For an example of this be sure to check Invoke. The tempo on Chants To Irkalla is mainly pretty slow. The only moments things are speeding up a bit are on He Who Drinks of Namma and during some moments in the title track. On this album there also can be found some almost hypnotizing moments. Two examples of this are halfway during Ziggurat Ablaze, with at a sudden moment also some spooky vocals added, and during 2/3 of the title track, right before the earlier mentioned roaring guitars part, which also sound quite creepy. The vocals on Chants To Irkalla sound very raw, extremely low and dirty, which perfectly fits Druj’s music. During the start of Consort of Sin these vocals are temporarily done in a bit different way, here they are more scream-like, however they still are very fitting. During this moment, as well as during the end of this track some very high, shrieking vocals can also be heard. With the all-crushing closing track Ashes of Immortality Chants To Irkalla comes to an end of what has become a very nice album. With Chants To Irkalla Druj surely delivered an death/doom album which is an absolute recommendation for every death/doom metal fan. This is death/doom as it should be!